Lawyer, Philanthropist, and Public Benefactor, Charles Evans lies buried near the entrance of the beautiful cemetery he founded; a life-size statue is an enduring memorial to his vision and generosity. Any historical sketch of the Charles Evans Cemetery Company would be incomplete without some enlightening picture of its founder. Charles Evans was born in Philadelphia on March 30, 1768, the son of Quaker parents, David and Letitia Evans. At the age of 20, he began the study of law in the office of Benjamin Chew, one of the commonwealth’s foremost lawyers. Benjamin Chew had been attorney general of the colony and later became chief justice of the Supreme Court. In 1791, at the age of twenty-three, Charles Evans moved to Reading and was admitted to the Berks County bar. His success, gradual rather than rapid, was assured from the first. Three years later he married a Philadelphia girl, Miss Mary Keene, with whom he spent forty-four happy years. Left in his advanced age without a family, Charles Evans’ one determination was to make it possible for the people of Reading to have a nonsectarian cemetery removed from the city’s noise and bustle, where friends and relatives might linger and meditate. Most important, he decreed that it be a cemetery amply endowed, free from debt, unmarred by commercialism and perpetually cared for. To this end, in 1846, Charles Evans donated the original twenty-five acres of ground and the sum of two thousand dollars. Upon his death, a year later, on September 5, he further bequeathed in his will the sum of ten thousand dollars, and three-quarters – or almost sixty-seven thousand dollars – of the residue of his estate. Charles Evans lies buried in the cemetery of his endowment, where a fitting monument marks his final resting place. 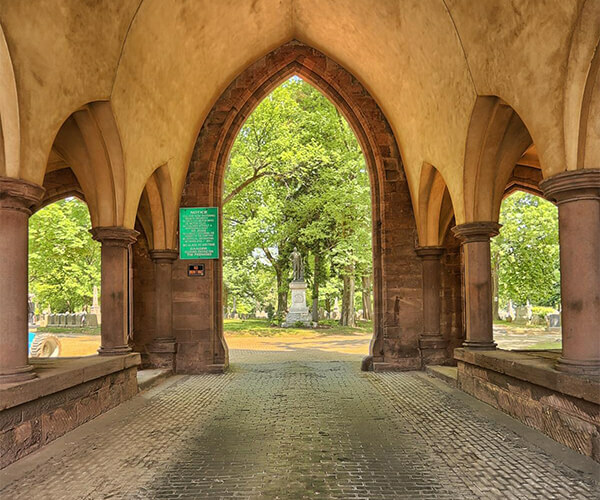 The Cemetery was founded in 1846 by Charles Evans, a prominent local lawyer and philanthropist who desired to establish a nonsectarian cemetery where the friends and relatives of those departed might linger and meditate. 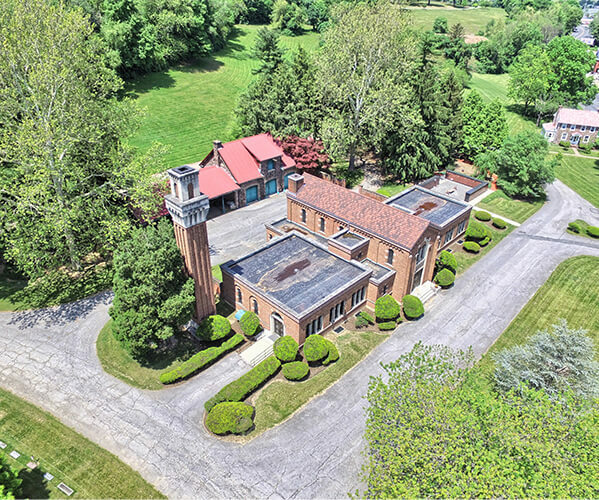 Employing unusual vision, Charles Evans selected and purchased 25 acres of land on a prominent hilltop situated, at that time, a mile outside the City limits. It was to be for all people of Reading, a dignified place of interment where natural beauty would be preserved and enhanced with the years He provided money for a Trust Fund to be used solely for the purpose of making the Cemetery even more beautiful with the passing years – to provide perpetual maintenance of its buildings, trees, shrubbery, and spacious lawns. The most prominent architectural feature of the Charles Evans Cemetery is the sand-stone Entrance Way which adorns the main access along Centre Avenue. Completed in 1852, this impressive structure reflects the Gothic Revival style which was popular at that time. Located immediately north of the main entrance gate, the Tudor-style office building was constructed in 1927. 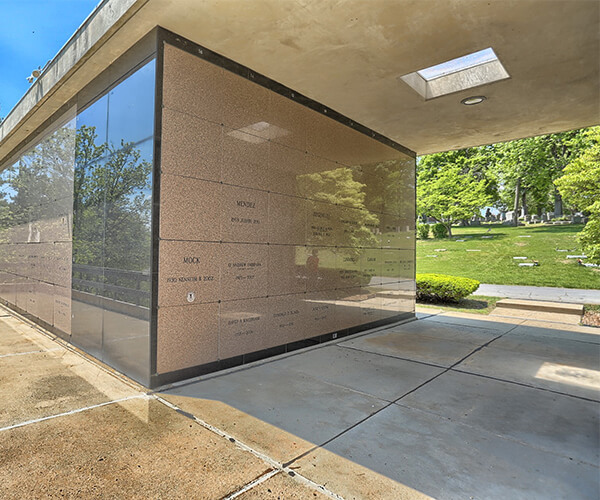 It provides space for administrative staff, the secure storage of records and an appropriate setting to discuss the services offered by the cemetery. 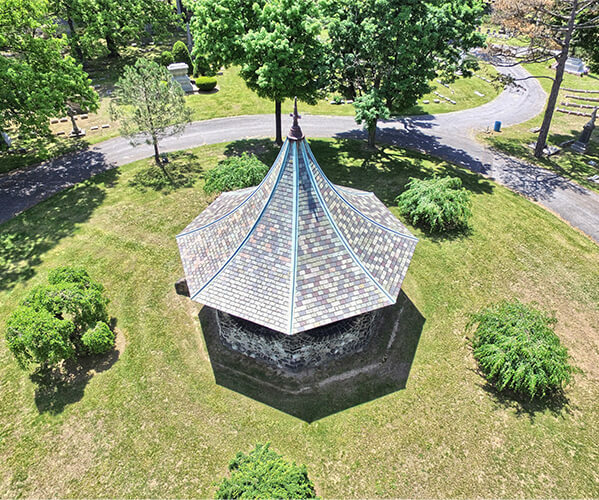 A Crematorium, Chapel, and Columbarium are all housed in a handsome Italiante-style structure situated in the eastern portion of the Charles Evans Cemetery, in the vicinity of Perry Street. Added in 1939, this building features a stately bell tower, a majestic bronze entrance door and artistically designed windows. The impressive Chapel is available for quiet meditation or for services during inclement weather when graveside attendance is impractical. To the side of the Chapel is the Columbarium, where memorial urns find an everlasting resting place, safe from the elements. Imperishable bronze niches of various sizes are available for individual or family use. The original cremation chambers were replaced in 1993, utilizing the latest technological advancements. 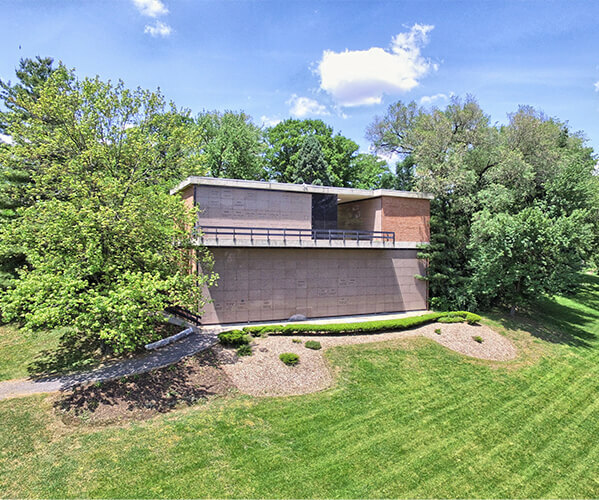 The Chapel Garden Mausoleum was built in 1972 and the Hillside Mausoleum was added in 1981. These two free-standing structures provide granite-faced crypts and niches for above-ground interment. 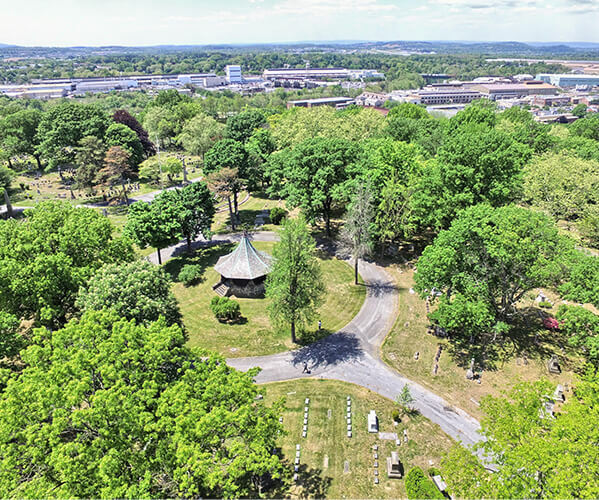 More than a century and a half old, the Charles Evans Cemetery is now surrounded by urban development, but still retains the quiet, stately grandeur of a long-established and well cared for interment facility. In addition, its central location makes it readily accessible to all the residents of Berks County. The Cemetery now includes 119 acres of well-maintained grounds, with more than seven miles of paved roads which make the extensive grounds convenient to visitors. It continues to be a virtual arboretum, with over 2200 trees of impressive variety and maturity, as well as an abundance of flowering shrubs. The exquisite landscaping and extensive charm make the Cemetery an appropriate setting for quiet reflection and soothing contemplation. That phrase from the original charter, perhaps more than any other, indicates the foresight and public spirit of the founder. Charles Evans Cemetery was to be more than what was commonly known as a “burying ground.” It was to be, for the people of Reading, a dignified place of interment whose natural beauty would be forever preserved and improved with the years. Since its establishment in 1846, the founder’s wishes have been reverently carried out by the Board of Trustees. The office of Trustee has been regarded as an opportunity to perform a civic service. So it is that Charles Evans Cemetery Company has attracted so many of Reading’s leading citizens, who have served long years without compensation – rewarded only be the satisfaction of a worthy service well done. The impressive character and beauty of the cemetery is forever assured by a Trust Fund, into which goes all income above actual administration expenses. No profits can ever be distributed. Instead, the money is used solely for the purpose of making the cemetery even more beautiful with the passing years… to provide for perpetual maintenance of its trees, shrubbery and spacious lawns. The original donation of twenty-five acres has been increased, from time to time, by additional purchases of adjacent land. Today, the cemetery comprises more than 127 acres of enclosed land. Much of the developed area is still available and many undeveloped acres are reserved for future needs. 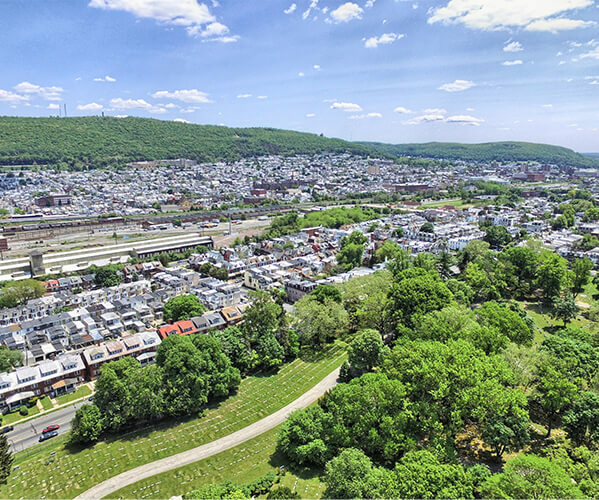 Although more than 62,000 persons are now buried here, this beautiful cemetery will be able to meet the requirements of Reading and Berks County families for generations to come. Charles Evans Cemetery Company was incorporated by the Act of the General Assembly of Pennsylvania, approved February 24, 1846. The incorporators were the Hon. John Banks, president judge of our courts, John S. Hiester, Dr. Isaac Hiester, James L. Dunn, Esq., Samuel Bell, Dr. Hiester H. Muhlenberg, William Strong, Esq., later a justice of the Supreme Court of the United States, Matthias S. Richards, Esq., William Darling, Esq., Dr. Diller Luther, William Eckert, Benneville Keim, and Peter Filbert, Esq.